RE/Advantage offers a wide selection of modules to add features and functionality to your site, while keeping the cost down. These modules have already been built and are ready to be customized and integrated into your REAdvantage site or backend. Our team of professional programmers can implement any of these modules or even add a entirely new one. The thing to keep in mind is that we can custom program just about anything for you if we have not already created it. 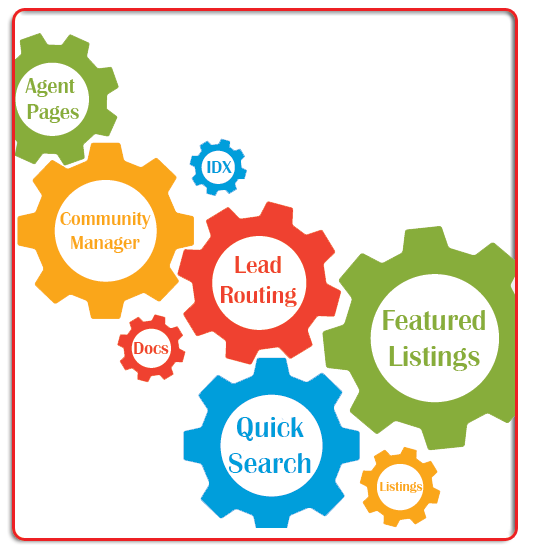 Highlight your own agent or office listings on your home page or any other location on your site. Our Featured Listings module updates automatically with your MLS data (requires IDX subscription). Give your visitors an easy to use quicksearch widget in any position on your site. The widget can be also be customized to only allow the user to search among property types that you might specialize in. Showcase the communities you service with this advanced module that allows you to enter detailed community information, image galleries and more! Do you specialize in condo communities or high-rise building? Our Condo Manager allows you to enter this information and create useful resources for your visitors including photos and floorplans. Medium to Large offices can now leverage their branding and extend it to agents wishing to create their own unique online presence. Agents within your office can now have their own site with self-editable bios and accomplishments, while still being completely branded within your corporate site. Agents also automatically get their own MLS listings displayed within their site to create a professional image. Instead of manually distributing leads for your own office listings, with Agent Lead Push, we automatically detect a lead on a listing that belongs to your own office, and we send it directly to the listing agent in your office. This saves your admin time and eliminates mistakes. If you have a larger office with a lot of agents, our Round Robin module is worth considering. When a lead comes in, Round Robin will automatically distribute the lead to agents your designate in a sequential round-robin fashion. Agents get notified of the pending lead assignment, and have a time limit to accept the lead. If a lead is not accepted, the system assigns it to the next agent in sequence, ensuring an even distribution of leads. Any unaccepted leads are assigned to your office admin, so nothing is ever lost. Many of our customers have a series of rotating images on their home page. To make it easier for our customers to change these images at will, without knowing how to program, we have built our Image Rotator Manager. Using our backend, you can upload and remove images for your rotator and assign hyperlinks without knowing any HTML programming. With our Document Manager you can easily upload doucments such as Word, PDF's or Excel spreadsheets. These documents can be made public for your clients and prospects or made private for your staff only. We even allow you to group them. Easily create public and/or private calendars and events. If you want to easily publish news or articles our News Manager makes this a snap. You can even attached PDF's or images to each entry.